(Bloomberg) -- Revlon Inc.’s continued cash burn, disappointing fourth-quarter sales and a delayed 10-K filing that may reveal a “material weakness” in its financial reporting controls sent shares plummeting as much as 11 percent Tuesday morning -- pleasing no one but the bears. And bears there are a plenty. Revlon short interest is more than 32 percent of the float, according to S3 data. That’s about 2.26 million shares out of 7 million shares. Eighty-six percent of the shares outstanding are owned by Chairman Ronald Perelman, according to Bloomberg data. That makes for an ownership structure that leaves the stock “inherently volatile,” according to Jefferies analyst Stephanie Wissink, the only sell-side analyst covering the beauty company. Meanwhile, even before the fourth-quarter release, the stock has been pummeled in the last month, sinking 27 percent, as recent industry data showed worsening sales trends for Revlon’s brands. Among Revlon’s problems; it needs to invest more in its brands, some licenses on fragrances are expiring, and the company isn’t getting shelf space to sell its mass-market perfumes. Revlon’s executives said on Monday’s conference call that some retailers were moving away from the entire category, but that it remains optimistic. "We’re always exploring new business and new licenses to sign for our company," CEO and president Debra Perelman said. 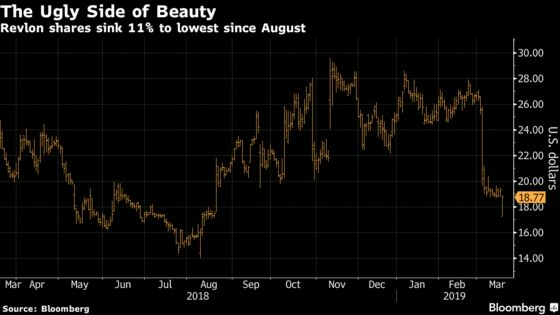 ”Revlon has long underinvested in advertising, and while the move to align promotions with product innovation is good in principal, time and more money will likely be needed to yield fruit, in practice,” Noel Hebert of Bloomberg intelligence wrote in a note Tuesday. "The delayed 10-K is less of a concern, but is emblematic of a tendency toward self-inflicted wounds that need correcting," he said. As for the latest quarterly results, sales sank 5.7 percent year-over-year, with declines in every portfolio except prestige brand Elizabeth Arden. “Our concerns around sales and profit trajectory arise from the continued weakness in the mass channel in North America where Revlon faces increased investments to defend space,” Wissink wrote in a note. In addition, cash burn continues, and there is “limited flexibility” in the model, she said. The analyst has a hold rating on the stock and slashed the 12-month price target to $18 per share from $24. After Perelman, the next largest holder is Mittleman Brothers LLC, with a 5.4 percent equity holding. According to Mittleman’s website, Revlon was the firm’s second largest position, as of December 31, representing 15.9 percent of its portfolio.